A male northern cardinal takes flight. Photo by Howard Cheek. No other bird symbolizes Christmas quite like the northern cardinal. Bright red males of this species adorn everything from greeting cards to clothing, wrapping paper, tree ornaments and other decorations this time of year. Throughout much of the United States, cardinals also are among the most commonly sighted backyard birds during the winter months. (In my Washington, DC, Certified Wildlife Habitat®, eight “regulars”—four males and four females—jostle for position daily among hordes of house sparrows mobbing the seed feeders.) Unlike many bird species, cardinals do not migrate in the fall, and males retain their colorful plumage throughout the winter. Recently released statistics from Cornell Lab of Ornithology’s 2009-2010 Project Feederwatch season reveal that the northern cardinal was the number-one reported species in the Southeast and South-Central regions of the country. The bird ranked among the top ten in several other regions: the North-Central, Mid-Central, Mid-Atlantic, East-Central, Northeast, Great Lakes, Allegheny and Atlantic Canada regions. 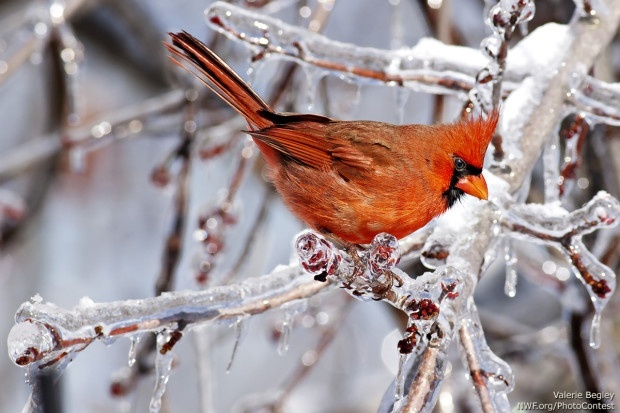 A cardinal perched on an ice-covered branch in Kentucky. Photo by National Wildlife Photo Contest entrant Valerie Begley. It’s easy to lure cardinals to your yard. “If you plant shrubby vegetation—preferably the varieties that will produce edible fruits—cardinals will respond,” says backyard birding expert George H. Harrison. The birds prefer thickets and evergreens for nesting and roosting. Cardinals are known to eat more than 100 kinds of seeds and fruits. Native plants that provide these foods include shrubs such as serviceberry, flowering dogwood and arrowwood viburnum and trees such as eastern red cedar, white pine and elm. Cardinals also feed on insects, particularly during the long nesting season. To attract cardinals to feeders, set out sunflower seeds, safflower seeds, cracked corn or apples. Place the food on a sturdy platform or hopper feeder near shrubs or other cover. Water for drinking and bathing is also critical. To prevent freezing, consider maintaining a heated birdbath in cold weather. Voice: Song is a set of clear whistles, often rendered bright bright bright, cheer cheer cheer. Call is a sharp, high tik. Sources: “Turn Your Yard Into a Red Zone” by Melanie Radzicki McManus, National Wildlife, February/March 2006 and National Wildlife Federation Field Guide to Birds of North America. Make your yard inviting to birds and other wildlife by becoming an NWF Certified Wildlife Habitat®. Help NWF protect and recover the wild places that sustain wildlife by symbolically adopting a northern cardinal.